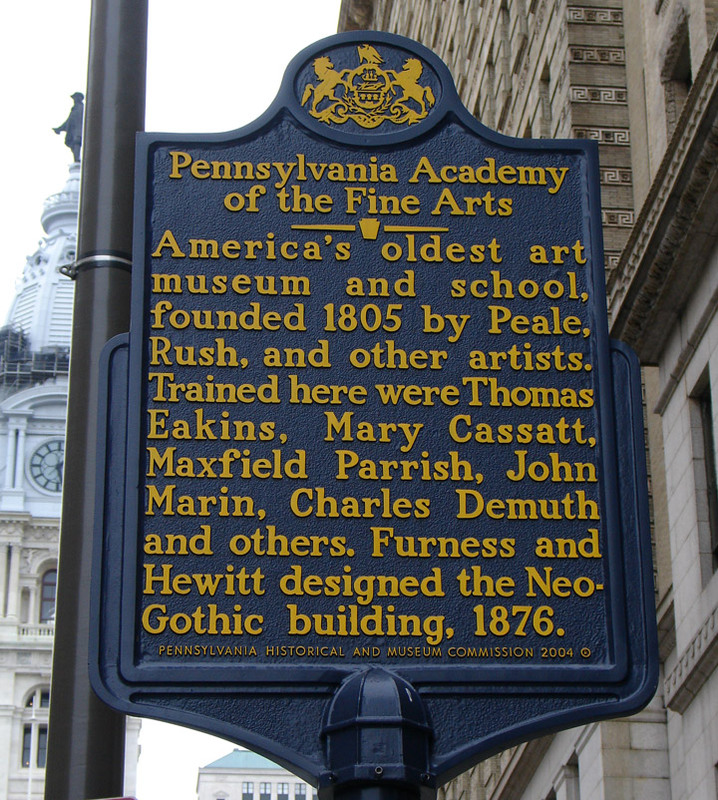 On April 22, 1876, while America celebrated its centennial, the Pennsylvania Academy of the Fine Arts marked an important milestone in its then 71-year history with the opening of its new building. 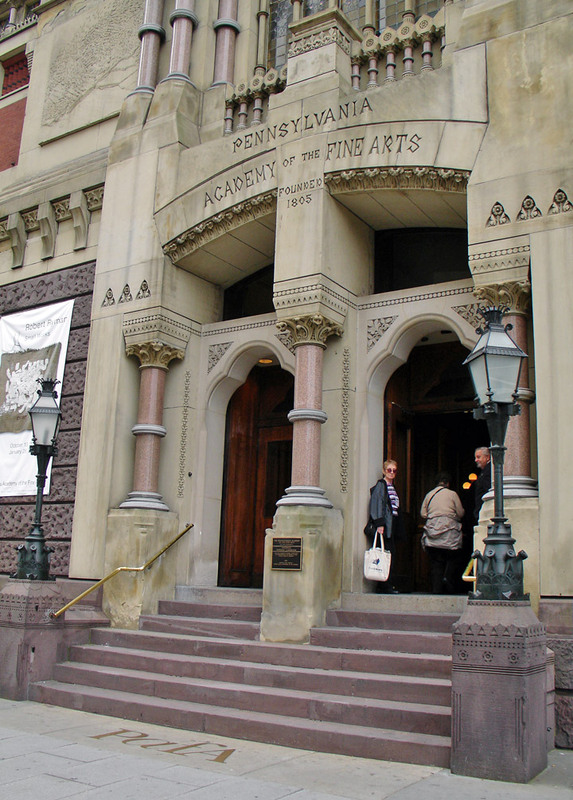 While the museums in New York City and Boston (both founded in 1870) were but fledglings, the Pennsylvania Academy began its eighth decade in a striking and revolutionary new home. 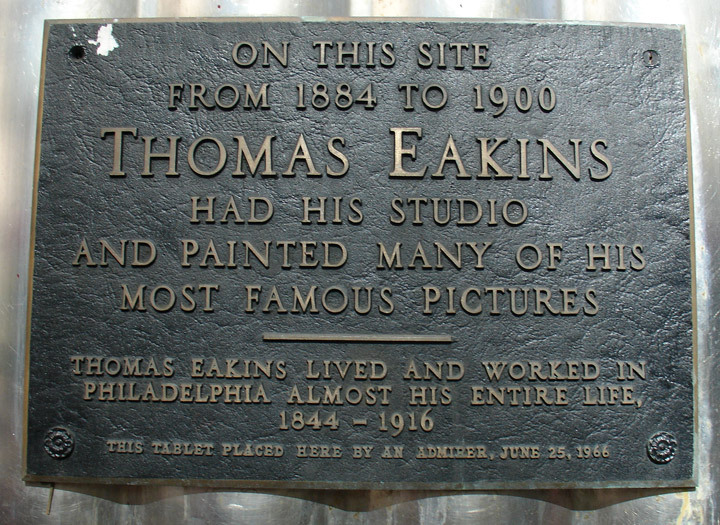 The building, designed by the Philadelphia firm of Frank Furness and George Hewitt, is generally considered to be primarily the work of Furness who finished the project after the partnership dissolved in 1875. 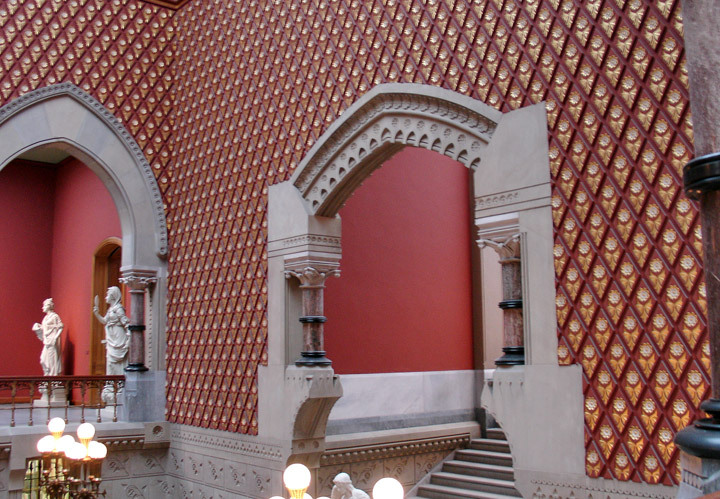 Furness had been a pupil of Richard Morris Hunt who introduced him to the esthetics of the modern Gothic revival. 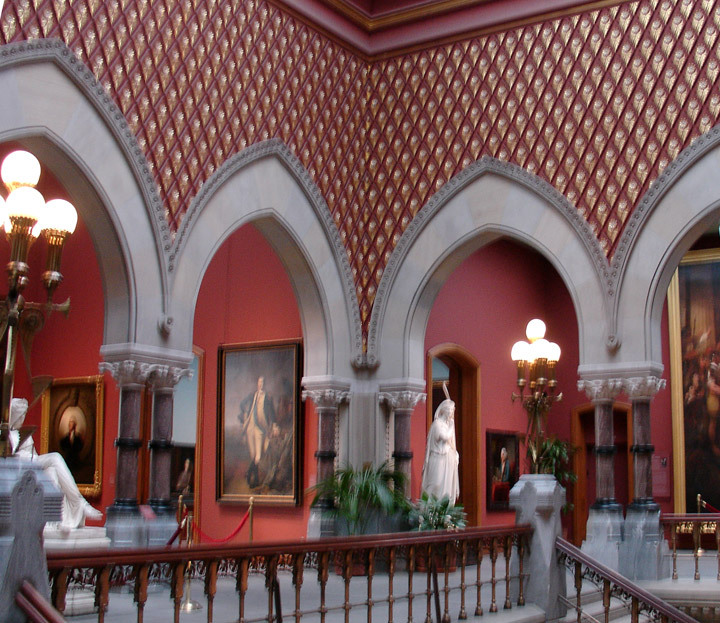 This included John Ruskin's appreciation of the richly colored designs of 14th-century Venice, Owen Jones's and Christopher Dresser's Eastern influenced ornament, and Viollet le Duc's use of foliated decoration combined with cast-iron architecture. Rising 70 feet above the sidewalk, the Academy must have seemed a towering fortress in 1876. Today, dwarfed by more recent buildings, it looks like a decorated jewel box. On the facade, heavy courses of dark stone rise toward a roofline marked with such colorful elements as red and black brick patterning, fanciful floral motifs, and a bas-relief frieze depicting famous artists of the past. A gothic window dominates the central pavilion and creates a motif that recurs inside. After entering through a low vaulted hall, the visitor steps into the spectacularly ornamented Grand Stair hall. 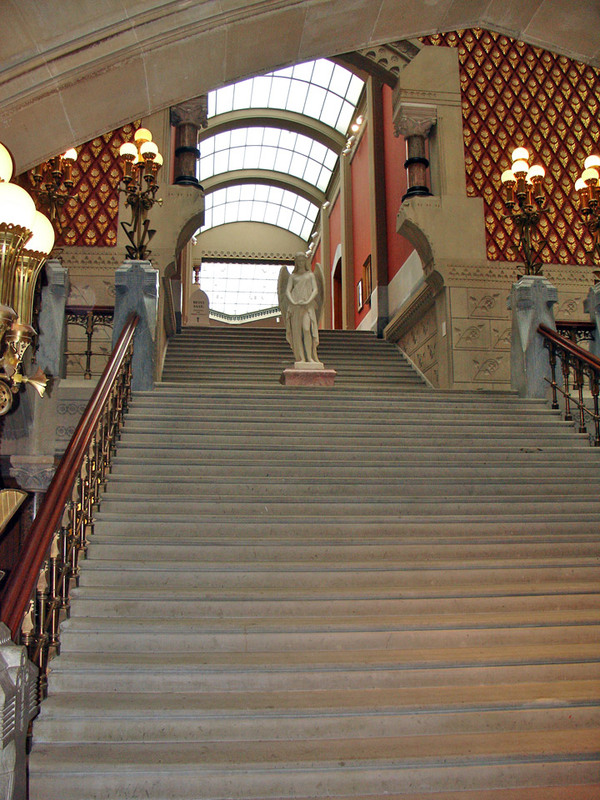 Its staircase, bordered by richly tiled floor and walls, and bronze and mahogany banisters, sweeps upward to the gallery level. This grand space is ringed with gothic arches carrying gold rosette-studded walls. The vaulted ceiling above is painted a brilliant blue with silver stars. 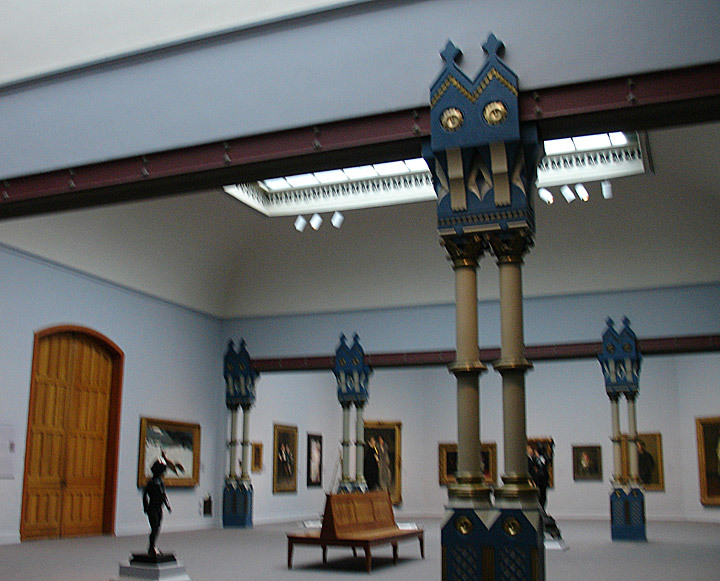 Beyond are the galleries where foliate columns support exposed steel beams, one of several radical design elements in the building. 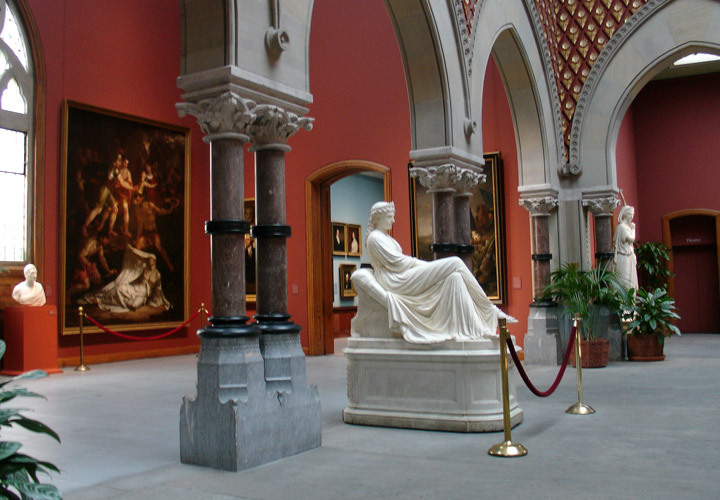 The Academy is considered one of the finest surviving examples of Victorian Gothic architecture in America. 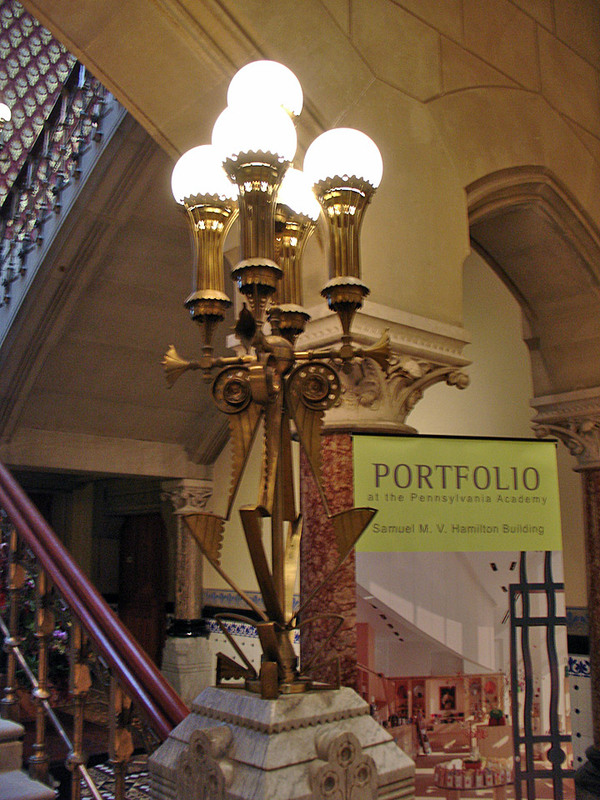 It provides the museum with a magnificent setting for the presentation of its collections and special exhibitions. As the modernist architect Louis I. Kahn observed, the Academy is truly a life-giving and inspired building. 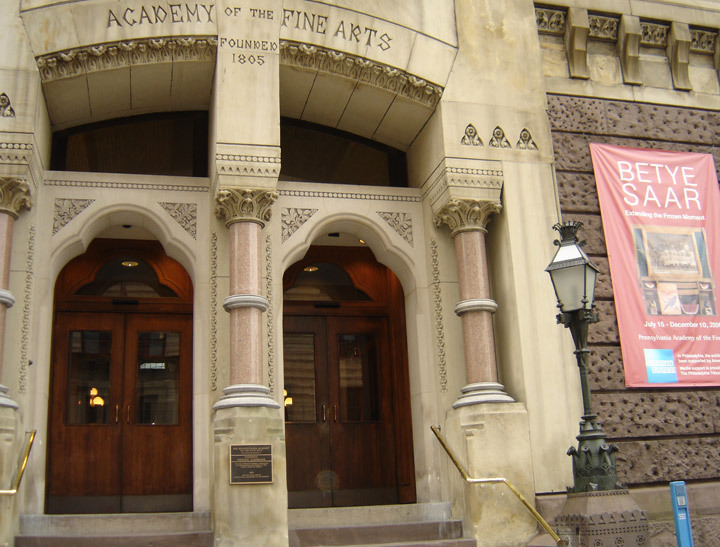 Since its founding in 1805, the Pennsylvania Academy of the Fine Arts has been committed to fostering and collecting American art. We are pleased to present highlights of our permanent collection, one of the foremost collections of American art, ranging from colonial masters such as Robert Feke, John Singleton Copley, and Benjamin West, to major contemporary artists including Richard Diebenkorn, Red Grooms, and Faith Ringgold. 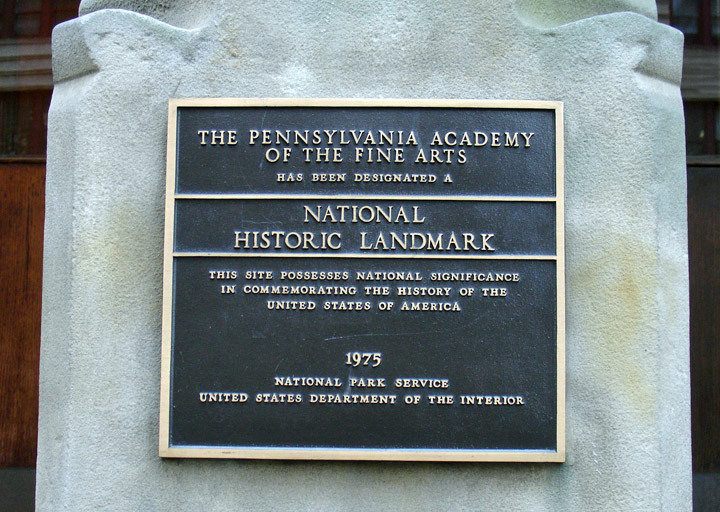 Many of the nation's most important artists were founders, teachers or students at the Pennsylvania Academy, including Charles Willson Peale, William Rush, Thomas Sully, Thomas Eakins, Thomas Anshutz, Mary Cassatt, Cecilia Beaux, William Merritt Chase, Henry Ossawa Tanner, Charles Grafly, Maxfield Parrish, Robert Henri, John Sloan, William Glackens, Everett Shinn, George Luks, Violet Oakley, Arthur B. Carles, Daniel Garber, and Robert Gwathmey - all of whom are represented in the Academy's collection.